review « Write, or Else! This week’s edition of Reading Radar features a book I got through an Amazon promotion. This epic fantasy starts with the former mercenary, Notch, in prison for a murder he didn’t commit. He escapes from prison and meets the future Protector of the Monarchy, Sofia Falco. Sofia, however, has her own problems. She becomes the first female Protector in a hundred years when her brother is proclaimed dead at sea. The person she is supposed to protect, the prince and heir to the throne, makes it clear he does not want her services. She discovers that her noble House is under threat from enemies within as a war begins to brew in the world beyond her kingdom. I found the world-building in the opening chapters very well-written, and I have to applaud the author for following three very different POV characters. These three character threads seem rather disjointed at first, but I could tell from the beginning that the threads intersect later on. I appreciate the author’s fairly crisp narrative, and I found the characters to be very fascinating. I look forward to reading the rest of the story, and I think you will too. That’s it for now. I should get back to reading – and writing, of course! I’ve been a member of the Online Book Club forums, forums.onlinebookclub.org, for several months now, and it’s been a great way to see books I might never otherwise hear about. People in the forums talk about books of all types, but the main focus is on ebooks, especially those released through programs like Kindle Direct Publishing. Online Book Club has a mailing list which features new releases from authors in the forums. Many of these books are offered absolutely free, while others can be read for free with a Kindle Unlimited subscription. All books have been vetted and reviewed by a team of reviewers – and you can join the team! As they say, the main draw for reviewers has always been the exchange of books for reviews. No one goes into this expecting to get rich or anything! As a serious writer, however, I need to read, so this program appeals to me as a way to get some pocket change while I keep up with what independent authors like me are writing. If you are a writer yourself, or you just like to read a lot, this is a chance for you to get a bit of money for something you already do. So if you don’t read very much already – you won’t get much out of this. As a new reviewer, you can probably expect not to get paid at first. You still get free books, and your review will be featured to members of the forums. By participating in the forums and reviewing as often as you can, you can expect to get better opportunities for reviews as you go. Once you do get paid, you can expect between $5 – $60 per review. Myself, I only read through 1 or 2 books every month. I listen to many more on audio – I have an hour long drive to work, and I like to use that time, darn it! However, I am reading, and I will use this review program not so much for the money, but for a chance to keep up with current writing trends and to network with other authors. This program seems worthwhile if you also need motivation to keep reading, or if you already read a lot. I’ve been reading a lot of serial and web fiction lately, but North of Reality by Uel Aramcheck is different from most. Rather than being a strict serial, it is a blog from the author’s imaginary realm – each piece is either a short story or an encyclopedic entry from another universe. One of the best examples of the self-contained story entries is “Then Before If“- I loved how this piece plays around with the paradox that arises from knowing the future, and builds a rather poignant story around it. My favorite encyclopedia entry so far is “The Projectile Heart“, informing readers that humans can eject their hearts through their mouths in extreme situations (just like sea cucumbers vomiting up their insides). I’ve really enjoyed everything I’ve read from this site so far. Since each piece can be read on its own, it makes it a great site to stop by once every few days for a weird fiction fix. My next writing goal – have Chapter 10 of Far Flung ready for the next Tuesday Serial Collector! Howdy! I’ve got a First Impression here. I’m looking at Fade to Black today because one of the authors contacted me and asked me to. Yeah, I do that kind of thing, when I can. 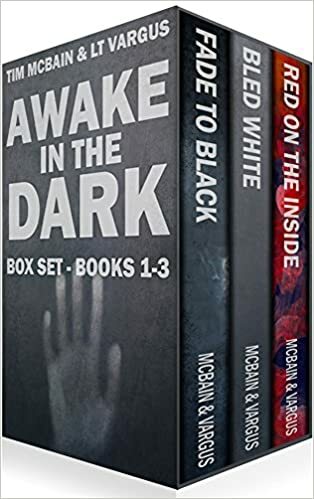 At the Amazon page for the Awake in the Dark series, I read the first chapters of Fade to Black by Tim McBain & L.T. Vargus. Any minute now a hooded man will come barreling out of nowhere and kill me. I know this because it has happened six times before. I wake up in this alley, hung from a post by a piece of rope lashed to one ankle, tied in a hangman’s knot. After several minutes of work, I pry my bonds free, and about thirty seconds after I hit the ground, this guy in a black hooded robe gives me a pretty bad case of death. So that gives a pretty good idea of the “voice” of this work – witty, sardonic, and dark all mingled nicely. It’s a funny read with a quick pace, making for nice easy reading. The narrative is a little raw at times – I thought it could have been a bit crisper. There are few too many adjectives and adverbs for my critical eye, but the style can be justified as the main character’s storytelling. I thought some lines were trying too hard to be witty, but overall I appreciated the humour. The story starts with a nicely intense sequence with Jeff Grobnagger running from someone trying to kill him. The reader learns that Jeff has run down this datrk alley before and has been killed already, six times before! The reader then finds out that Jeff passed out from a seizure while in a grocery store and had the dream or vision of his own grizzly death. Jeff is helped by Glenn, another customer at the store. Jeff, refusing to take an ambulance, instead accepts a ride to Glenn’s home. Glenn thinks that Jeff’s seizures are a form of astral projection, and Glenn reveals that his missing daughter was involved with groups interested in magic and the occult. Thanks to the fast pace and humour, this is a series I’ll definitely try out. At the very least, I’ll check out the first book in the series – it’s less than $1 for Kindle.